What do you do when you’re waiting to cross the street? Most of us look around, get lost in thought or maybe strike up a conversation with an attractive fellow pedestrian. 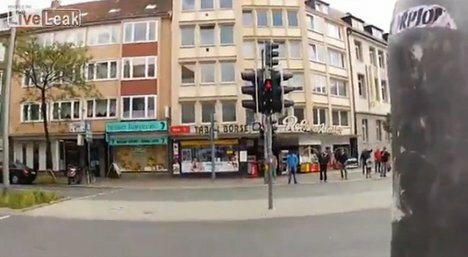 At one awesome traffic light in Germany, walkers can fill those seconds with a short game of Pong against someone waiting at the opposite corner. A small touchscreen device on the traffic light pole counts down the time left before the light changes. At the same time, it lets you control a paddle that bounces a virtual ball across the screen. Keep the ball from hitting the “wall” on your side while trying to hit the “wall” on your opponent’s side to win. We don’t speak German so we aren’t sure whether an explanation for the game is given in the short video. Perhaps it’s a safety measure to encourage pedestrians to wait at the corner rather than trying to dash across the street between cars. Or maybe it’s just there to add a bit of unexpected fun to pedestrians’ days.